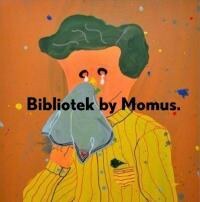 Bibliotek doesn't change any of the things that turn people away from Momus, but even in his artistic obstinance he manages to craft what might be his best work to date. Momus has never been an artist that seems to care much for what people think about him. His eccentric musical proclivities have yet to move away from low-grade Casio keyboard sounds, he examines taboo topics like child molestation and necrophilia (respectively, "The Guitar Lesson" and "The Cabriolet" from 1989's Don't Stop the Night), and his influences range from obscure parts of Japanese culture to the least accessible parts of French philosophy. Plus, it's usually not the case that breakout singer/songwriters are eyepatched Scottish guys named after the Greek god of satire. Thus it should come as no surprise that Bibliotek, his twenty-somethingth release, is as obtuse as anything he's put out before. The instruments are so lo-fi and quiet it's as if he recorded the album several feet away from the mics. (In a clever turn, many of the samples used throughout the record were sourced from YouTube.) His voice is disinterested and often off-key. But amazingly enough, these all end up being reasons why Bibliotek works so well. Momus writes great pop songs in roundabout ways; his brand of songwriting masks the infectious hooks he dims with subdued production values. This is a risky method, and even though it doesn't always pay off, when it does it gives a pretty convincing impetus for other artists to record with atypical production techniques. Additionally, much like Momus's past work, the melodies and hooks really serve as a means to enter the world of his lyricism, which is the real draw of this LP as well as his entire body of work. There are many examples of his sharp wit and wordplay here, but two are worth isolating. The first is "Core"; backed by a brilliantly placed sample of Al Bowlly's "Guilty", Momus sings from "the bowels of the earth" where he has found his home after being left by his love. With equal measures vengeance and loneliness, he says to her, "wishing to hell you were here." The second is the title track, another rumination on loneliness from the perspective of a library book. Both of these songs are Momus at his best, a considerable feat for a musician who has lived on the fringes of obscurity for as long as he has.